I’ve only rigged a few models, but I’ve done the old way (vertex groups) and the new way, as demonstrated by the BSOD character rigging tutorial. I’ve found a few problems though, and I know a few other, more experienced users, have run into a few of the same problems. Using just the weight painting method can be very clunky. It is way too easy to accidentally highlight adjoining parts of the mesh. When I weight-paint my characters arm, I always find the brush has high-lighted a small patch of the chin or some other limb. When the character moves his arm, his chin starts to bob out of form in sync with the arm. 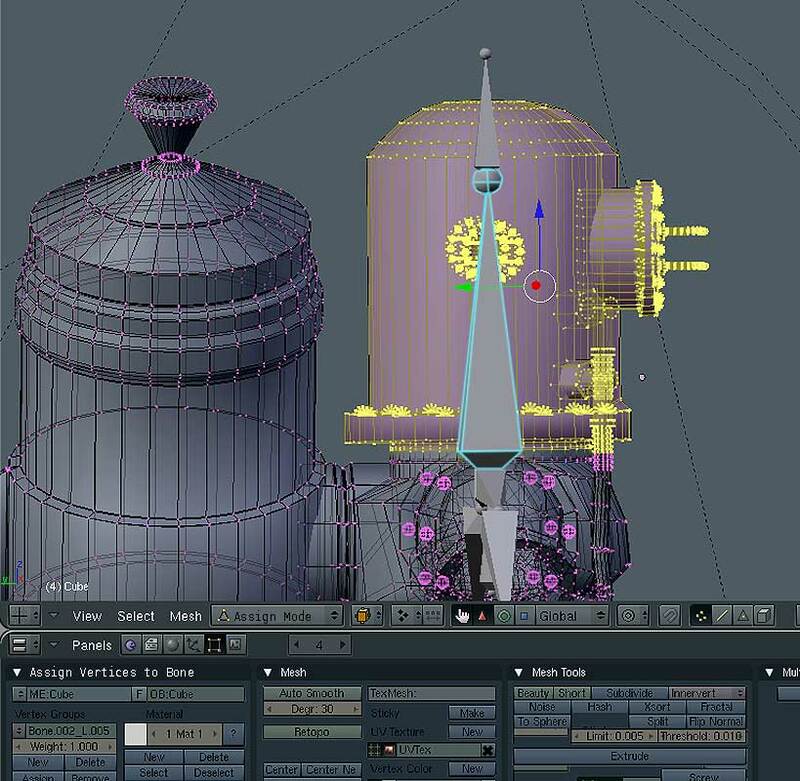 Tracking down all these problems – especially in a complex or dense mesh, can be a nightmare. Also, it is difficult to highlight hidden vertices in folds and within other objects. I know a lot of more experienced Blender users are going back to the old ‘Vertex Groups’ method, at least to initially assign vertices to bones. I personally find this a shame as it’s a retrograde step and also, having to use both systems at the same time strikes me as clunky and counter-productive. I came up with what might be a good way of making a compromise between the new and old systems. I imagined the new weight painting system, but combined with a lot of the vertex editing tools you find when in standard edit mode. It might be that you would want to differentiate this mode into a separate function so it doesn’t get confused with weight painting. Possibly we could call it “Assign Mode”. It would work just like the weight painting mode, but you would have standard vertex editing tools. You would see the vertices rather than the shaded skin of the model. Like Weight Painting mode though, you can see the bones underneath the mesh and you can highlight them as long as the armature is in pose mode. The work flow would go like this: You would go to the modifier panel as you do now and assign an Armature modifier to your mesh. You would then enter Assign mode and be presented with the vertices of the model in front of you. It would look just like Edit mode on the screen, except that the armature would be visible too. You would RMB highlight a bone to select it (just like in weight painting mode). Then you would hit the ‘B’ key and use the selection tool to highlight the vertices that you want to assign to that bone. Hopefully the standard shift and control select methods would be available as well. To make things really cool, you could also be able to select and hide different vertices, this would make assigning vertices on complex models much more easy and intuitive. At the bottom, on the control panel, would be a ‘Assign Pane’ with different buttons such as ‘Assign to Bone’, ‘Remove from Bone’ and other commands you usually found in the vertex groups control panel. One important one I would suggest is “Remove from other Bones” which would stop the annoying habit that the current system has of accidentally tagging vertices to the wrong bones during weight painting. Once you had assigned the bones to the vertices, you could then switch up to Weight Paint mode to fine-tune your rig. I know this sounds very much like the old vertex groups method, but it doesn’t rely on creating vertex groups and keeping track of them separately to the weight painting and bones. It is more an extension of the new method and is very much more intuitive and less complicated than vertex groups. Basically all you do is click on a bone and tell Blender what vertices go with that bone. Job done! I like it! Now to find someone to do it for the next build! I’ve got no coding knowledge at all. Do you know if I should post this somewhere else? You can enter Face mode (F), select Faces, Tab into Edit mode and hide them (H) then goto WeightPaint mode and paint only wat’s left. Unfortunately it seems they are getting rid of Face mode. Unfortunately it seems they are getting rid of Face mode. I don’t think that (fortunately). In the SVN-Version there is a painting mask button in the window header, and it still works with F-Key. Anyway, my workflow is like this, I select the bone, paint a bit, go into edit mode, select all, remove all, so you have a new vertgroup for the bone with nothing assigned. then by selecting bones, you assign them full weight. then in weight paint mode you just paint a subtraction. that way you don’t assign other verts. No, UV Face Select, but I’ll bow to SoylentGreen on this. I have no evidence, just a suspicion that this is the direction it’s headed.